If you ask any group of professional golfers which tournament that they would most like to win during their career, the vast majority will more than likely say The Masters. One of 4 major golf tournaments in the world,The Masters is held every year in Augusta, Georgia in April and is the first of the 4 tournaments to be played. The Masters has been the site of some of the most memorable and legendary performances ever seen on a golf course including wins by some of the best in the game like Arnold Palmer, Tiger Woods, Gary Player and Jack Nicholas. When he retired at the ripe old age of 28, golf legend Bobby Jones set out to create a course that would be one of the best not only in the United States but in the world. It was 1930 and the Hall of Fame golfer went all the way to Scotland in order to bring back architect Dr. Alister Mackenzie to design the course he had been dreaming about for several years. When it first was announced in newspapers around the country that Jones and McKenzie would be creating a world-class golf course the headlines were ecstatic. It wasn't long before Clifford Roberts, an old friend of Bobby's, found 365 acres in the city of Augusta that he believed would be suitable. One of the most surprising things at the time was the news that Jones had actually chosen McKenzie, a foreigner, over some of the great American golf course architects like Donald Ross. It's believed that he met with the Augusta National Golf Club committee on July 10 at the Vanderbilt Hotel in New York. It was at this meeting that he was offered, and accepted, the opportunity to bring Jones' vision to life. A day after that meeting they met to play at the Bayside course on Long Island, New York, a course that McKenzie designed and that had recently opened. From there it was on to Augusta and a three-day visit to walk the grounds, look at drawings and start making preliminary plans for what would be known as Augusta National. When you consider that it was 1930, the speed at which Augusta National was built was extremely fast, especially compared to the speed at which similar golf courses are created today. It was in October 1931 that Jones and McKenzie got together to begin routing the course. McKenzie returned to his home country but came back to Augusta in March 1932 and, during a two-month visit, completed to shaping the greens as well as overseeing the clearing of land and roughing out of the 18 holes. During that same time Bobby would practice hitting shots while Mackenzie observed so that they could make adjustments to the course on the fly. It's been said that McKenzie and Jones got along famously during the entire time that the course was being created and there's even a famous quote from Jones that goes "I suppose no two people ever agreed better… on a golf course." He added that "Dr. McKenzie and I tried each other out thoroughly. Our ideas seen to be synonymous." May 1932 saw the completion of seeding and, in December of the same year, the course was officially opened to players. In January of the following year a formal opening for the course was held. Interestingly enough, the course struggled financially for the first few years and, at one point, it was even suggested that it be used to hold the U.S. Open in order to make it profitable. That idea, thankfully, was discarded and, in 1934, the first invitation only tournament was held. It would eventually go on to be known as the Masters. Unfortunately Dr. McKenzie, the genius behind the one of the most beloved courses in the world, passed away in January 1934 and never got to see a Masters played, hear the roar of the crowd or the accolades from the many players who found the course phenomenal. We mentioned that, at least during its first few years, Augusta wasn't exactly the extremely popular (and profitable) golf course or tournament that it is today. There were a few reasons for this, including the fact that in the 1930s golf was in its infancy in the US and it was hard enough to actually give tickets away to tournaments let alone sell them. Adding to the problem was that the second world war was going on in Europe as well as the Great Depression in the United States. Even after the war ended it was hard to find people willing to shell out even a few measly dollars for tickets and they could often be found for free at many downtown banks and shops. Lowery Staub, the architect who designed the famous Eisenhower Cabin at Augusta, was an Augusta native. In an interview years later he said that "people didn't really know much about golf tournaments." He added that "the city was much smaller than it is now." That all changed at the turn-of-the-century however as the city of Augusta, including local businessman and many civic leaders, got together in support of the tournament and helped to turn it into the international event that it is today. Indeed it was the help of these local businesses that turned a four-day golf tournament into a weeklong festival of parties, celebrities, Southern hospitality, fashion and gambling. "Augustus saw it as an opportunity to make the city foremost in presentation" said Jim Davis, a news director and former anchorman for one of Augusta's local television stations. Indeed, for one week in May every year all the people in the city can think about is golf and the other attractions that the Masters brings with it. The tournament benefited from the fact that, back then as it still does today, Augusta had a very strong sense of community and pride. Add to that the fact that local businesses, including restaurants, hotels and so forth, were profiting greatly and you can imagine why they were so keen on supporting their growing claim to fame. Before long there was a Masters Week Committee that would oversee all of the events being held during the week of the Masters tournament including a parade down Broad Street, a beauty pageants showing off the feminine pride of the South, the black-tie "Golf Ball" and even, starting in 1957, a horse show. One of very first people to support the Masters was Jim Cullum of Cullum's Department Store on Broad Street. His wife Lillian was one of the first people to make calls and organize the Broad Street parade. She said in an interview that she remembers being given hundreds of paper tickets by tournament officials to give to customers at their downtown store in the weeks prior to the big event. Augusta was given a big shot of national fame when ‘Ike' Eisenhower and his lovely wife Mamie visited the course in 1948. He was at the time a retired 5-star general but his fame from his exploits in World War II meant that his visit to Augusta was front-page news. During his first visit he was said to have played golf every day and bridge every night. It was only six months later that the future president became a member of the club and, in the ensuing years, returned to Augusta 45 times. Interestingly, he never actually attended the Masters and usually planned his trips so that he would arrive right after the tournament had ended. Along with the British Open, the PGA and the U.S. Open, the Masters is one of 4 major golf tournaments recognized in the professional world for professional male players. Due to the difficulty of these 4 courses as well as the high level of talent that usually takes the field, all 4 are considered to be best way to judge a professional golfers skill and talent. They are also used to determine the standing among professional golfers worldwide. Both Tiger Woods and Jack Nicholas have been quoted as saying that winning major championships like the Masters is one of their highest goals as golf competitors. Considering that Nicholas is the all-time major championship leader and Woods is right on his tail, you can see why the Masters often sets the tone for how a professional golfer will perform in the other three majors. On GolfLink.com Augusta is ranked the number two golf course in the world and indeed, on most of the "best of" golf course lists worldwide, you'll find Augusta National consistently ranked in the top 10. When the world's top professional golfers meet there in May every year the weather as well as the greens are in their best condition of the year and the trees around the course are in beautiful, full bloom. 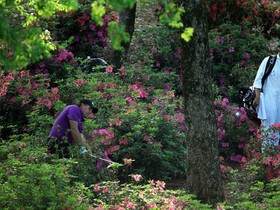 Numbers wise Augusta is a 7,435 yard par 72 course. It has some of the most demanding shots of any golf course in the world and some of the shots with the longest distance as well. Many of the holes at Augusta are world-famous including 11, 12 and 13 which have famously come to be known as "Amen Corner" for their extreme difficulty. Indeed, the performance on those 3 holes has often been the determining factor during the last day of the Masters. One of the most celebrated landmarks on the course is the "Eisenhower tree" which is located approximately 210 yards from the 17th hole tee. The reason it holds that particular name is simply that Pres. Eisenhower, who played the course often (as mentioned above) hit the tree so often that at one point he actually made a request that it be removed from the course. His request was obviously denied and the Eisenhower tree remains in play on the course even today. Who has the most victories at the Masters? The now world famous "green jacket" of the Masters is recognized worldwide. The person who's won the most of them is Hall of Fame legend Jack Nicklaus with 6 titles. Mr. Nicklaus also happens to be the professional golfer with the most major titles at 18. It's interesting to note that the green jacket given to the victor is only allowed to be taken home by them for 1 year and then must be returned to Augusta. After the first year and its subsequent return, they are allowed to use it whenever they visit the course but they are not allowed to take it off the premises again. In 1975 golfer Lee Elder was the first African-American to participate in the Masters tournament, something that is seen as a watershed moment not only for the tournament but for the sport of golf in general. In 1997 the first win that Tiger Woods achieved is considered by many to be one of the most important, as well as memorable, moments in the tournament's long and storied history. There have been, to be sure, many thrilling finishes at The Masters over the years. One of the first was in 1935 when Jean Sarazen tied Craig Wood in the final round of the tournament with a double eagle on the 15th hole. A 36 hole playoff ensued where Sarazen bested Wood buy 5 strokes. When Robert De Vicenzo incorrectly signed his scorecard on the final day of the tournament in 1968, he allowed competitor Bob Goalby to win the coveted Green Jacket by one shot. Unfortunately for De Vicenzo even though he had shot a 17th hole birdie of 3 his scorecard showed a par 4. Had he not made the mistake there would've been a playoff with Goalby to settle the tournament. In one of the most famous upsets of Masters history Larry Mize defeated Greg Norman when he holed a chip shot on their second playoff hole. One of the top golfers of his time, Norman unfortunately never one of Masters. Finally there was the win by Phil Mickelson in 2004 when he became one of only 4 golfers to win the Masters by birdying on the 18th hole. CheapTicketsASAP.com acts as an intermediary between buyers and ticket sellers to facilitate the purchase and sale of The Masters tickets, and as such is not directly involved in the actual ticket sale transaction between the buyers and TICKET SELLERS. All sales are final. As tickets sold through CheapTicketsASAP.com are often obtained through the secondary market and prices are determined by the individual seller, the prices for tickets may be above or below face value. The Masters Tickets sold through CheapTicketsASAP.com are from a third party; therefore, the buyer's name will not be printed on the tickets. Tickets may be sent by email when stated so. Please note that the name on the tickets does not affect the buyer's ability to access the The Masters event.